Making your very own servo robot is only a workshop away. Did you always want to make awesome things with microcontrollers but thought it might be too complicated or didn’t know where to start? No idea what a microcontroller does but like the shiny robot in the picture? Come to the Intro to Arduino workshop, Tuesday, September 27th, 7-9 PM. 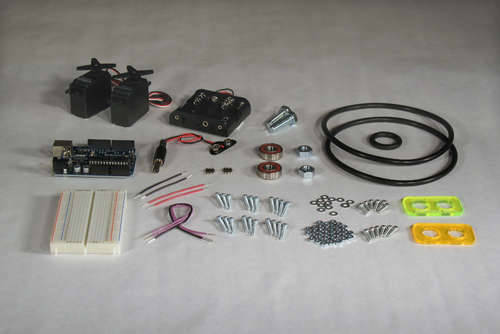 You’ll get your very own Arduino board and all the instruction you need to make your very own programmable robot. Best part about taking our workshop: We have a laser cutter and all kinds of fancy acrylic so you can make super snazzy custom parts for your robot. Are you a great programmer but are intimidated by the electronics part? Don’t be! 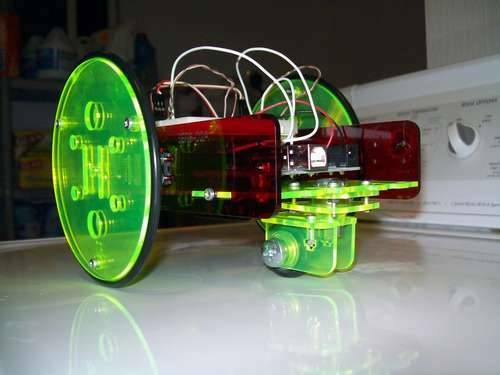 You can create robots and other projects with very basic electronics and no need for soldering. Does the programming part of this seem scary? We will help you get started. Only minimal programming is needed to make your robot go. Stay tuned for ways you can expand your robot’s capabilities.